Thuja socks in Paton's Jet. For my brother for Xmas. It's not exactly what I had planned to knit next but the wool was in its own plastic bag, at the top of my stash and I knew exactly what it was going to be - the perfect yarn to grab when fleeing a city devastated by an earthquake. Our family and friends are all safe and accounted for- many, like us, have fled to safer places. My thoughts are with those who are missing loved ones, and with the crews who are working day and night to search for survivors. I find it hard to express in words how distressing it is to see our beloved city in ruins. My mind is filled with a million 'what ifs'. I am thankful I am now a stay-at-home mum. When the quake hit, my 3yo was literally across the road at kindy, my other daughters one block away with their Dad at school. We were all together quickly. In years past I worked in the CBD. I still dont know if past colleagues made it out or not out of the multistorey building in Hereford St. I don't know if/when we will be returning home. Our suburb is one of the worst hit areas this time and while 75% of the city has power, our house still does not. No water or sewerage. Our street in broken pieces and covered in silt. While we wait for safer times, we're trying to keep the children busy - doing normal things and keeping them from the worst images. And as for me, I'm knitting of course. EZ was right - it is good for the troubled spirit. 11 books already this month and still another week or so to go. At this rate I will have no trouble making 52 in 52 - though I do not want to say this too loud for fear of jinxing myself! Room is the type of book you will either love or hate. The narrator is a 5yo boy called Jack who lives with his mother in "Room" - an 11x11 prison, but for Jack it is all he has ever known, until something happens and Jack discovers there is a whole new (confusing) world out there. At times the voice is annoying and being the mother of a 5yo, I also found it a little obnoxious and unrealistic in places. However the strength of this story is Ma's love for Jack - the sacrifices she makes for him, and her struggles to do her best despite the awful circumstances they find themselves in. At times, Jack's innocence makes the disturbing premise of the book even more haunting, but it is also a story of hope. Very touching and like so many other readers, it had me looking at the world with new eyes. I read this is under 24hours which should speak for itself. I listened to Brooks' Year of Wonders last year and was excited to make a start on another of her novels. People of the Book is an epic story that spans 500years. It isn't a light or quick read/listen but one I think that will stay with me for a long time. When I read, I read fast. Sometimes, too fast. My mental images are often a little blurry, details I have skimmed too quickly get lost. The thing I enjoy most about audio books is that they force me to slow down - the resulting images are stronger, I remember more details, and everything is a little clearer. For that reason, I'm really pleased I listened to, rather than read, this one. The book follows the story of a Jewish Haggadah (prayer book - as pictured) over five centuries. Cleverly, Brooks breaks up the historical weight by using a modern day narrator - a delightfully Aussie woman called Hanna who restores and researches ancient manuscripts. When she is chosen to work on the Haggadah she finds some interesting historical 'footprints' on the parchment - a wine stain, a grain of salt. 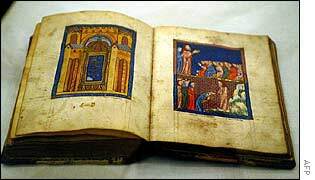 Brooks then takes us back in time ; we see how the Haggadah came to collect these memories of times past - how it survived several wars - hidden from the Nazi's, saved from the bombs in Sarajevo - how it survived the Spanish Inquisition, and in a perfect climax how it came to be made. The research that must have gone into this book is awe inspiring and at times, there is a feeling that it could almost be a treatise on anti-semitism, however, I think it is possible to turn off the inner cynic and just enjoy the rich history that Brooks has created. The audio version I listened to had an awesome authentic Aussie as a narrator and whilst it was the history that I enjoyed most, I also really enjoyed Hana's story - her journey of self-discovery and the relationships with her mother and with the mysterious and broken Ozren who she meets in Sarajevo. 5/5 for me. The Painted Man by Peter Brett. A rich fantasy novel that came highly recommended by members of my family. After reading lots of urban and YA fantasy novels it was great to read something where the characters are fleshed out a little more and the universe is more fully explored. The story follows 3 main characters in a world where demons rise from the Earth's core every night to feast on humans. Every community deals with the cloying oppression in different ways and each character has their own journey to become, near the end of the book, strong enough to face their fears. Another "couldn't put it down" - if you enjoy a good fantasy read then I can't recommend this one highly enough. 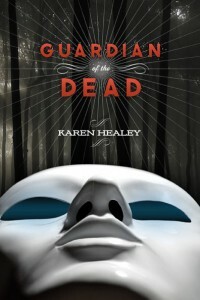 Guardian of the Dead by Karen Healey was recommended on a book club group on Ravelry. It is YA, set in Christchurch, and is excellent. How wonderful to read an urban fantasy set on the very streets I live in, to read about the University where I spent some of the best years of my life and recognize the descriptions of the theatre, the pub, the library. It made me realize how almost numb I have become to the US setting - cities and states I will probably never get to see, and to say I was excited to read a New Zealand setting would be a bit of an understatement. On the face of it this could be any YA novel - heroine who doesn't think she's pretty, boarding school, boy of the best mate variety, mysterious possible love interest, good vs evil....but Guardian of the Dead doesn't make any of these things feel like a cliche. The elements are there but at no point did they go over a line where I'd felt like I'd read it a hundred times before. The story is rich in Maori mythology and Healey bravely uses traditional myths and legends in a contemporary setting to create a truly spooky novel where the bad guys creep out of the mists in Riccarton Bush, and taniwhas swim up the Avon River. I borrowed this from the library but enjoyed it so much I will be buying a copy for our ever expanding YA collection of books. An excellent New Zealand novel. The Last Survivor's Series by Susan Beth Pfeffer is comprised of three books - Life as We Knew It, The Dead & The Gone, This World we Live In. The premise of this YA series is that a meteor hits the moon, pushing it off orbit resulting in a series of catastrophic natural disasters. They are harrowing reads at times and if you are at all worried about 'end of the world' type scenarios these books will have you checking your food stores and stashing disaster kits. After the earthquake here last year we had a small taste of the panic buying, power outage, boil your drinking water type scenarios so the idea of a global scale event was pretty horrifying. Whilst the writing might not be the best I've ever read these books certainly gave me much to think about. Last night I finished The Book Thief by Marcus Zusak. I need a little more time to digest that one and come up with coherent thoughts so more on that at the end of the month. So far in 2011 - 19 books , 36% of my goal. What have you read this month? 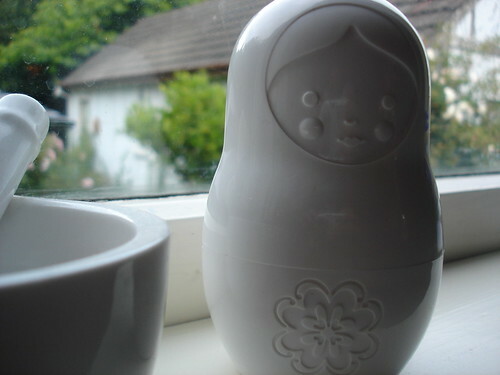 Baking is more fun with Matryoska measuring cups. (a much loved birthday present from my Mum). The girls and I have been baking lots of cupcakes lately. N5 got a cupcake baking set (recipe book and silicon cupcake cases) for Christmas and we have been slowly making our way through the recipes. 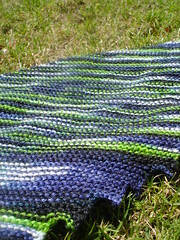 My Hitchhiker scarf is finished. I love it. Squishy and soft, something a little different for me in both colours and style. I have already worn it a couple of times (very chilly first thing this morning - autumn is just around the corner!). 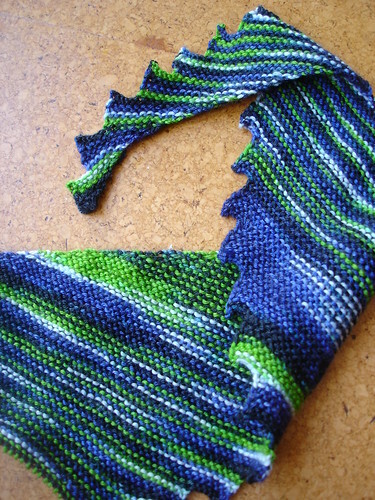 The yarn (Tri'Coterie merino/bamboo sock) was deliciously soft and did all sorts of interesting stripe effects. 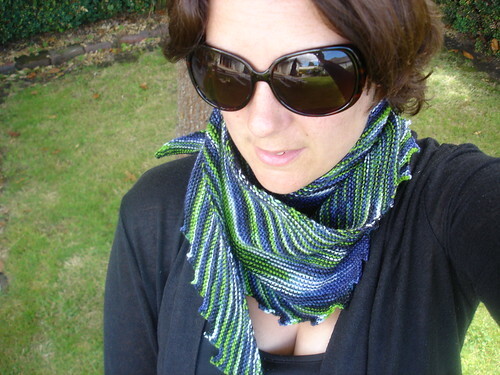 I really like bamboo blends for both knitting and wearing. I used 3.25mm needles (simply because I don't have any 3mm tips) and ended up with 40 'teeth'. The pattern calls for 42 (did the hitchhiker moniker just became clear?) and I probably might have got one more- I had 4g left over at the end but I didn't want to risk it and be binding off while holding my breath. 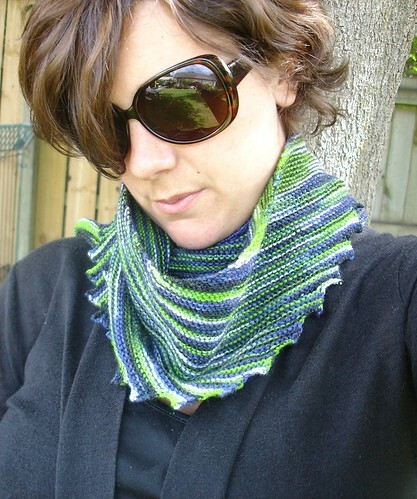 It's a great length for wrapping around and wearing it "kerchief" style. 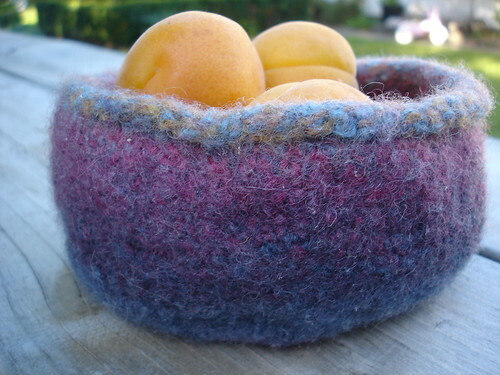 This is a fabulously simple but stunning pattern. I'm pretty sure this won't be the last Hitchhiker I knit! 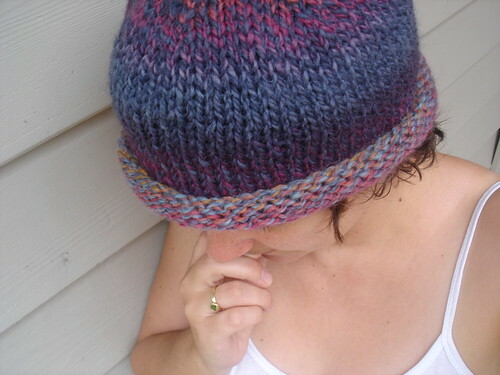 When I first saw the Hitchhiker pattern pop on Ravelry, it jumped out and yelled "Knit Me!" So I am. I couldn't deny it any longer. I love this pattern. It's a simple, easy-to-memorize 8 row repeat (aka perfect audio book knitting). Nice, squishy garter stitch. Stunning in its simplicity. 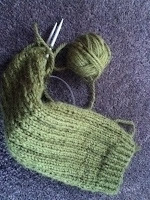 I'm using another Tri'Coterie yarn - Merino/Bamboo sock - which is amazingly soft and suits this pattern perfectly. The colourway is bright and colourful but the bamboo mutes everything a little bit - the black becomes a pretty heathered gray, the green doesn't screech bright lime. I whizzed through the first 20 repeats but now the rows are sooooo much longer my enthusiasm has waned a little bit. I'm in a bit of a scarf knitting phase at the moment since they're fashionable and wearable but don't require the effort/cost of an adult sized garment. 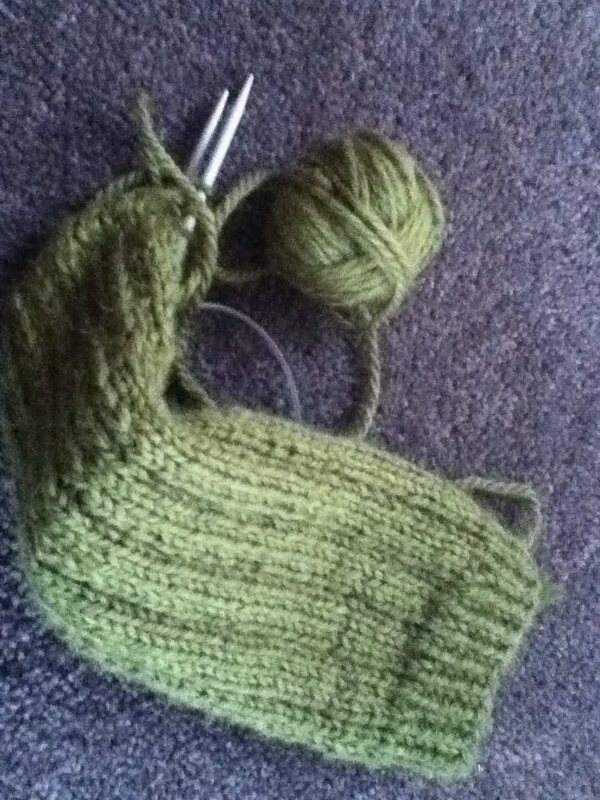 The pitfalls of course is how much knitting is required to get the length. I have 9(ish?) repeats to go now (the photo above was taken a few days ago now) so I am almost there. I can't wait to have it off the needles and add a little bit of colour to my usual black winter wardrobe. January's total is 8. That's 15% of my total after the first month so I'm pretty happy to be a couple of books ahead already. As well as the three books in the Mortal Instruments series I mentioned here, I also read Cassandra Clare's - The Clockwork Angel which is book one in her new prequel series, The Infernal Devices. I didn't enjoy it as much as the other three books, I think perhaps the Victorian setting was to blame there. I did enjoy meeting new characters but it was also a nice bonus to see some familiar faces too. I'm looking forward to reading more from this author - she's certainly one of my favourite YA authors at the moment. The reviews for this were good but it didn't really do it for me. 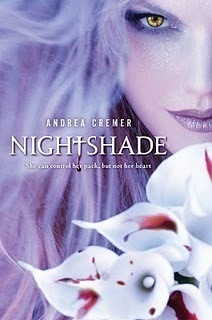 Another YA urban fantasy but not the best in this genre. The feminists (me included) will want to slap the heroine and I felt some of the characters were under-developed - which meant the inevitable love triangle was hard to believe. I still don't get the attraction to the new guy. There was some good bits - like some of the wolf/pack descriptions but sometimes it felt like every teenage cliche had been thrown in there. I read the whole thing which is something I guess, and the cover is pretty. But yeah. If you are looking for the best in YA - this isn't it. For fun I read Pride and Prejudice and Zombies: Dawn of the Dreadfuls. This is theprequel to P&P&Z which explains how the Bennett sisters come to be zombie slayers. At times this had me giggling and I really loved how the author kept true to some of the characters even while they faced a horde of "dreadfuls". P&P will always be one of my favourite "classics" (even more so the film versions with a dashing Matthew MacFadygen as Mr Darcy....just saying) and I enjoyed what we here in New Zealand would call this irreverent "piss take". I'm very keen to read P&P&Z (the proper) now. Funny, quick, irreverent - a perfect, lazy summer read. It also has a pretty cool cover. Heart's Blood by Juliet Marillier was a fast, easy read by one of my favourite fantasy authors. She was born in New Zealand but writes from Australia and I have several of her books from the Sevenwaters series. Heart's Blood is a stand alone book - a touching tale of love and redemption against a backdrop of a mysterious spooky forest and the "folk" who live there. If you like olde worlde type fantasies I can't recommend Marlillier's work highly enough. It's been several years since I read any of her books and I am hoping to catch up on the Sevenwaters series this year as there have been a couple more books published. February already (where did the summer go?) and I just read a book in under 24hr (!) so I am well on track for cracking 52 books this year. I'm keeping a list of "to-reads" on goodreads.com so if you have any must reads for me I'd love to hear them!